I ask students to trace around their hands and list things they’ve held or touched that mattered to them… seeing if we can land on some rich memories that can spring specific, concrete details. 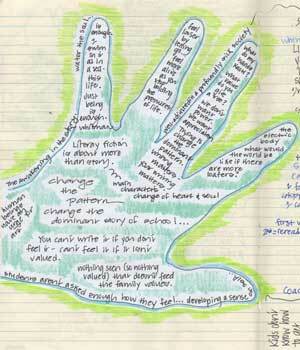 The first hand is one I sketched in front of 8th graders—first ideas in black, revisions in blue. The second hand (blue and green) was a collection of notes I took while listening to a speaker at UNH one summer. 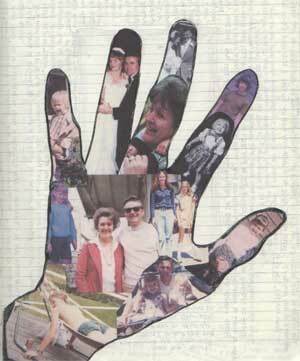 The third hand is a collage of family photos I used to cover my hand. This activity allows me to think about what I might write while I create it… and then the writing comes easier. 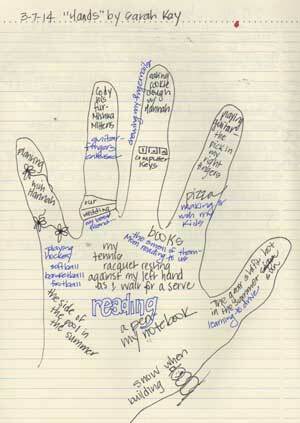 The fourth hand is filled with memories from a week at the beach with family. I show students that you can center all of the touch memories on one event or have a scattered list… it is just a way to access what is already there inside of us waiting to be written.